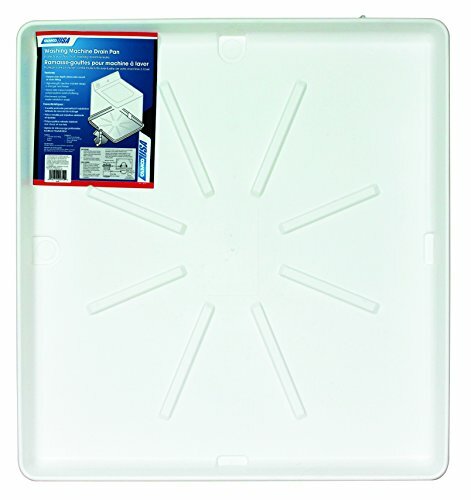 The Camco 30" x 32" Washing Machine Drain Pan is made of heavy duty impact-resistant polypropylene and resists shattering. The high-strength injection molded design is stronger and thicker. Pre-formed cut lines make installation easier. It includes a 1-1/2" / 1" drain fitting, locknut and washer. The deeper pan depth allows side mounting of drain fitting. Outside Dimensions: 32" x 30"; Inside Dimensions: 27" x 30"; Depth 2-1/2". White Matte Finish. Made in USA. Pokin 131208500 - Direct Drive Pump for Frigidaire Washer AP2106307, 3204452, 5303272432, 763, AH417159, EA417159, LP119, PS417159.